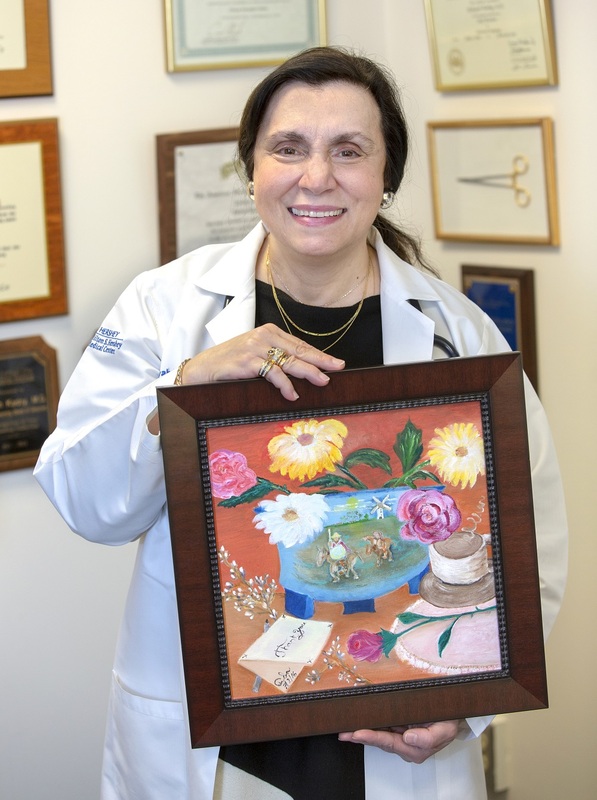 Dr. Zakiyah Kadry holds an oil painting created by patient Aida Breakall as a thank you gift for her lifesaving liver transplant. Aida Breakall of State College was dying from end-stage liver disease. Her survival depended on receiving a liver transplant. In 2016, she received that transplant at Penn State Health Milton S. Hershey Medical Center. Breakall said her son left the university where he was studying to take care of her. Friends also lent a hand. Before the transplant, Breakall said she couldn’t do much. “I painted to help me forget about my life. Since I had my transplant, life is better now.” She works at a day care center and is grateful to the doctors and staff who helped her. While Hershey Medical Center provides live and deceased liver transplants, the liver Breakall received came from a deceased donor. The United Network for Organ Sharing (UNOS) manages the nation’s organ transplant system. Allocation of transplants is based on how sick a person is. Patients are given a Model for End-Stage Liver Disease (MELD) score, which determines how quickly they might get a liver. The sicker they are, the more likely they will have a high MELD score and be at the top of the list. Hershey Medical Center is the only live donor liver transplant program certified by UNOS in central Pennsylvania. “This gives our transplant patients more options,” Kadry said. In a living liver transplant, a donor provides a portion of his or her liver so that someone — usually a family member or close friend — can receive a needed liver transplant. Doctors will review the potential recipient’s medical records to ensure he or she is a candidate for living donor transplant. The part of the liver that is transplanted and the part of the liver that remains in the donor will grow to normal size over time and both livers should be capable of functioning normally. Read the full article in La Voz Latina Central.